Lumihelmen A litter was born on November 17th, 2010! Our Emma (FIN*Kassilan Etevä Emäntä, EUR gs) and our novice Sampo (EUR d 22) got four kittens, two boys (EUR n 24, EUR ns 24) and two girls (EUR fs and EUR fs 24). 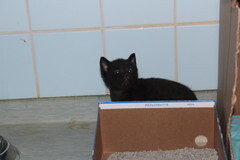 Both parents are healthy and they have been tested for FeLV and FIV (and they were negative). The blood group of both parents is A. Further information and reservations: Pirkko Mäenpää, tel. 358 41 4321 858, email lumihelmen@eurooppalaiskissat.net. Our kittens are ready to leave FIN*Lumihelmen cattery at the age of 12 weeks.